When I was growing up, my mom would have my brother and me make stockings out of construction paper. We'd hang them by the fireplace, and on Christmas morning, they had turned into real stockings. They even had our NAMES embroidered on them. I was always so excited that Santa had taken the time to give me a real, personalized stocking in the midst of everything he had to do on Christmas Eve. And if I had found the DKNY Be Delicious Rollerball And Lipgloss Duo inside my stocking one year? I think it would have sent me over the edge. I love this petite little rollerball so much, I've taken to carrying it around everywhere I go. I dab on the beautifully crisp and zesty fragrance after the gym, during the workday, before I meet my friends for drinks. And the sparkly pink lipgloss on the other end? So perfect for a daytime look with a hint of gorgeous shimmer. Not to mention the fragrance itself smells absolutely divine. Notes of cucumber, grapefruit, candid magnolia, tuberose, white muguet, rose, violet, sandalwood, tender skin accord, blonde woods and white amber combine with the ever-important American apple for a scent that's light, fresh and ... well, delicious! 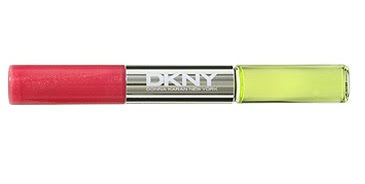 DKNY Be Delicious Rollerball And Lipgloss Duo retails for $20. Not really a fan of that scent, but what an amazing idea. I would LOVE a rollerball/lip gloss duo in one of the scents I wear. Be Delicious is one of my favorite perfumes. I didn't know they had a lip gloss! I bet it tastes wonderful. Can I still buy it if so where?